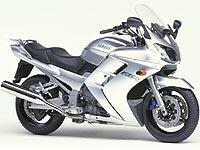 Yamaha is planning to offer ABS as an option on its FJR1300. Yamaha’s. Dan Harris, said: " The bike has proved incredibly popular, but a lot of fleet users, such as the police, are reluctant to use it without ABS. " Adding ABS would also give the bike more appeal to riders of heavyweight tourers like BMW’s K1200LT. " ABS would be compatible with the FJR, " continued Harris. No date has been set for its introduction. Is police FJR on your tail?